The Virginia Port Authority has issued $10.3 million in Newport News Terminal Revenue Bonds of 1980. The monies will be utilized to refinance the existing indebtedness on Piers B and C and to the City of Newport News, and to make several improvements to the terminal. 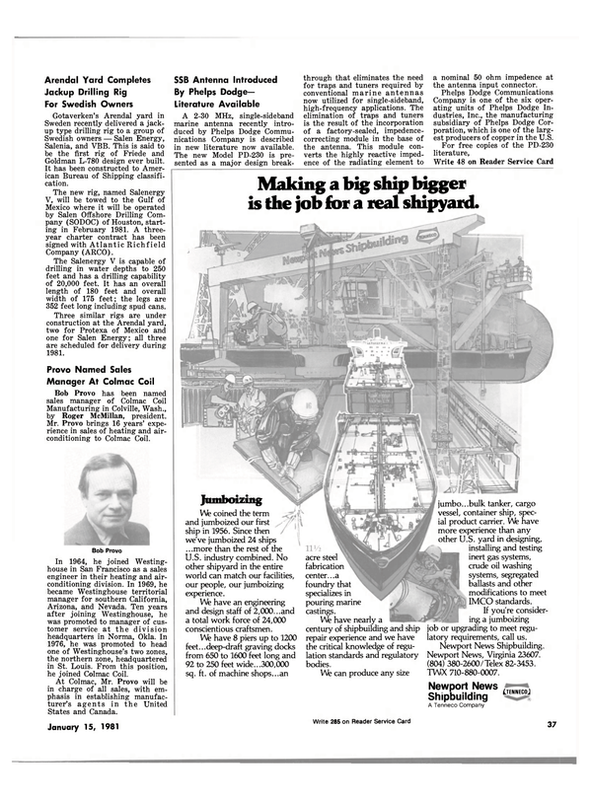 A portion of the $10.3-million bond and $3.9-million from a pre- vious general obligation bond will provide more than $7.7 million to be used to construct an extension to the existing container berth at Pier C, to construct a second container crane on the berth, and to create an additional 22 acres of open storage area. The pier improvement involves constructing an extension of the present container berth to allow handling of the larger containerships presently in use. The addition will add nine bays, each approximately 20-feet long, and will give the berth a new total length of 960 feet. The pier extension project has not as yet been submitted for bids. The container crane is of general- purpose design and will handle containers primarily, but it will also have the capability of handling heavy lifts up to 200 short tons. The storage area improvements include installation of Write 339 on Reader Service Card a surface and subsurface storm drainage system, subgrade and base construction of roadways and storage areas, asphalt surfacing of roadways and storage areas, concrete crane runways, and concrete t r a i l e r landing strips. Completion of the crane is expected in January 1981; the storage area should be available for use in late May 1981; and the pier extension should be completed in June 1981.